BU Instructor Information: Contact information for all of the current BU instructors can be found here:complete list of the current BU Instructors (external web-link). All BU instructors can provide training and administer examinations for diploma applications. The BU also offers an annual Summer School Boot Camp (external web-link) to provide intensive training and evaluation. If you want to become a BU instructor, see the BU Instructor How-To Guide (external web-link). BU Instructor Designations: The BU has three designations of instructors: professor, senior instructor, and affiliate instructor. For more information on instructor qualifications, requirements, and profit sharing, see the BU Instructor How-To Guide (external web-link). 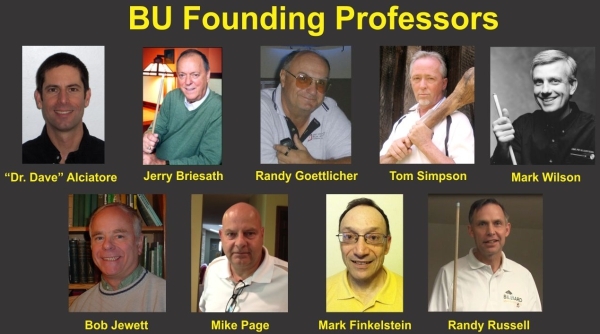 The founding professors (Dr. Dave Alciatore, Jerry Briesath, Mark Finkelstein, Randy Goettlicher, Bob Jewett, Mike Page, Tom Simpson, Mark Wilson, and Randy Russell) serve as the governing body of the BU. They are responsible for maintaining the high standards and integrity of the BU and its reputation. Other instructors who join the BU advance through the designations of affiliate instructor, senior instructor, andprofessor based on their level and seniority of involvement. There is no cost or commitment involved with being a BU instructor. You gain an additional credential. You will be promoted on the BU website via the online list of instructors (external web-link). You share in diploma and DVD profits (see the BU Instructor How-To Guide (external web-link) for details). You can market to prospective students, offering training and exam administration with clear goals, a graduation reward (an official BU diploma), and opportunities for future training, evaluation, and testing. You can use the provided exams to assess deficiencies and monitor progress of students and to help with their further development (as drills). The exams can serve as the basis for a curriculum or course outline. There is no cost (no application fee or annual dues) and no commitment (other than earning a diploma yourself or having a student earn a diploma).